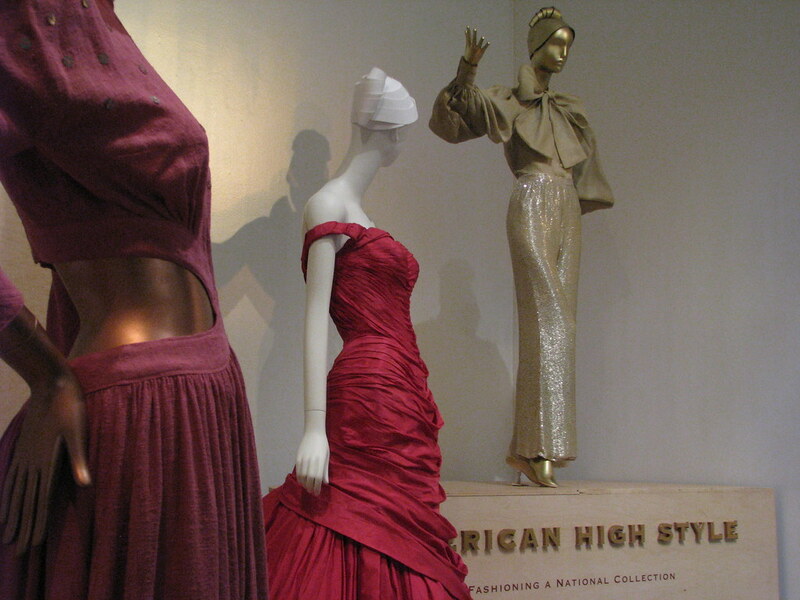 In Fashion: American High Style at the Brooklyn Museum. I’m not someone who is known for her fashion sense (my entire closet is one long, jazz-like riff on jeans and sneakers). 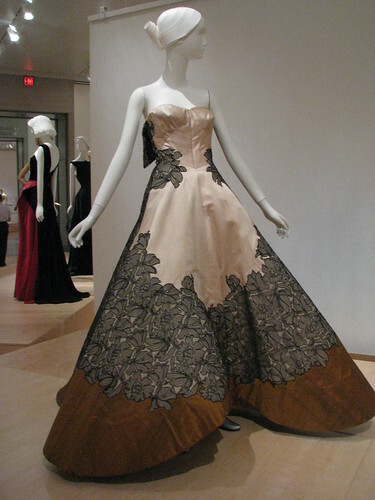 But that doesn’t mean I can’t drool over a beautifully-constructed frock when I see one. And the American High Style exhibit at the Brooklyn Museum, dedicated to chronicling the museum’s costume holdings, offered plenty to salivate over: Christian Dior, Elsa Schiaparelli, Cristobal Balenciaga, to name but a few. Of particular interest is the extensive collection of pieces by master cutter Charles James (1906-1978), whose Diamond Evening Dress (shown after the jump), made for heiress/philanthropist Dominique De Menil, is truly a wonder to behold. Overall, this show is a winner — beautifully and cleanly presented (unlike its sister show at the Met, which is supposed to be a hot mess). The only bummer is that the curators decided to pipe in a lite music soundtrack of operatic ahhhhhs that seem to have been taken from a Disney musical (from the part of the film where the princess wakes up). It not only made me grit my teeth, it made me want to commit random acts of violence on small animals. My advice: if you truly want to enjoy this exhibit: pack an iPod. 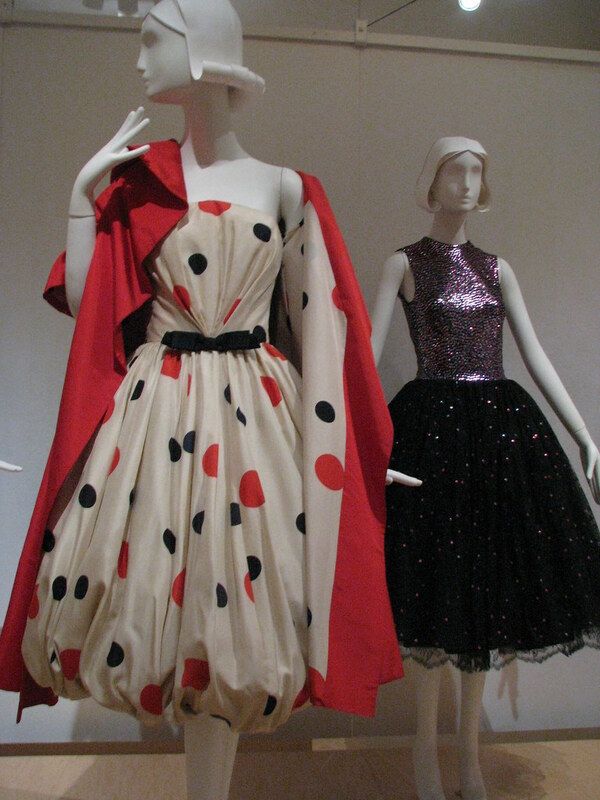 The show is up at the Brooklyn Museum through Aug. 1. 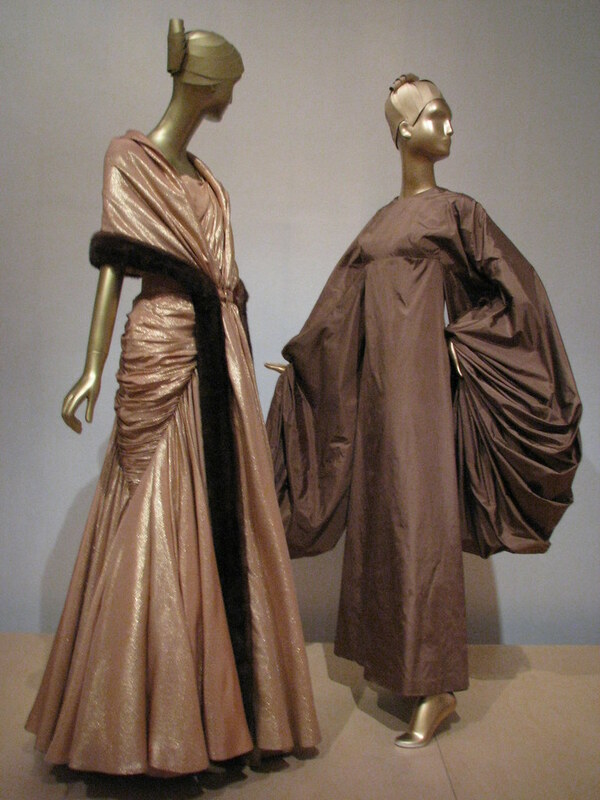 From left to right: frocks by Bonnie Cashin (1945), Charles James (1955), and Norman Norell (1970-71). 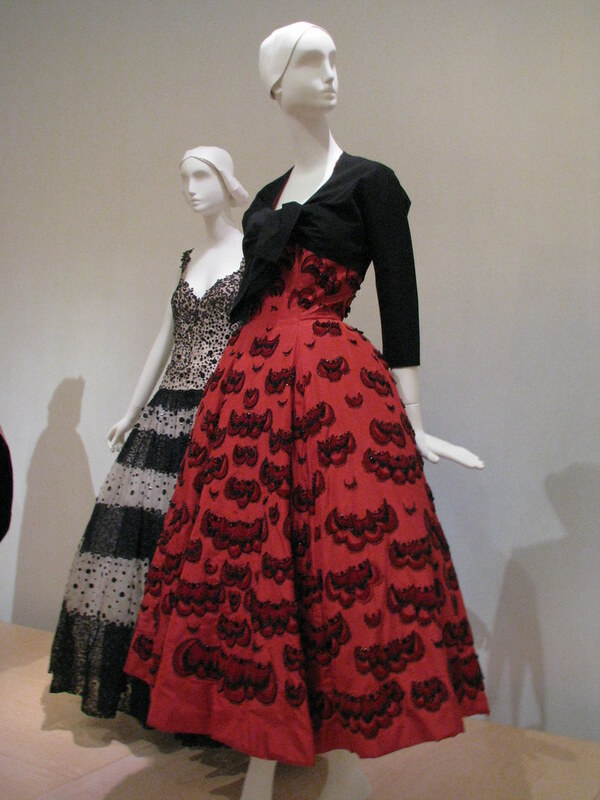 At rear, an organza and lace evening dress by Balenciaga (1945) and a fiery red 1952 Dior ensemble that was made for Eva Perón (though it is not known if she ever actually wore it). 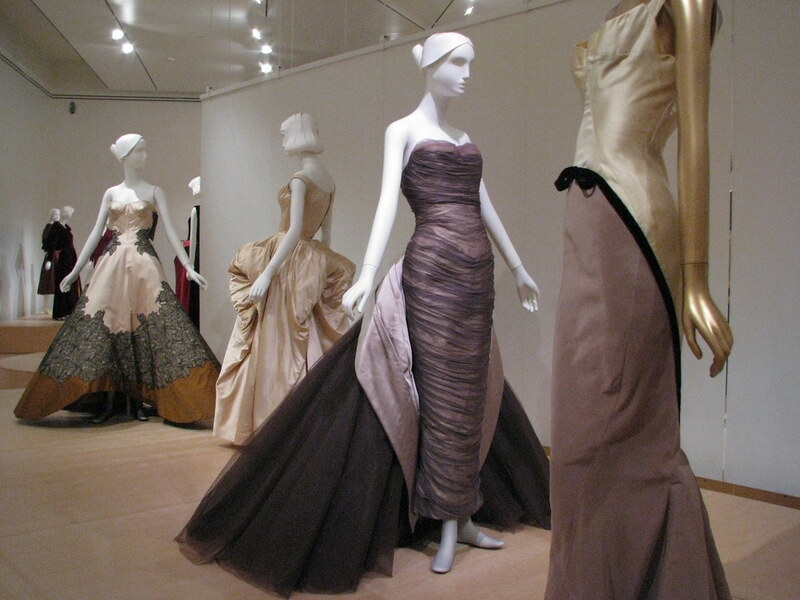 Making my inner girly-girl drool: a row of Charles James gowns. His sculpted Diamond Evening Dress, from 1957, is at right. 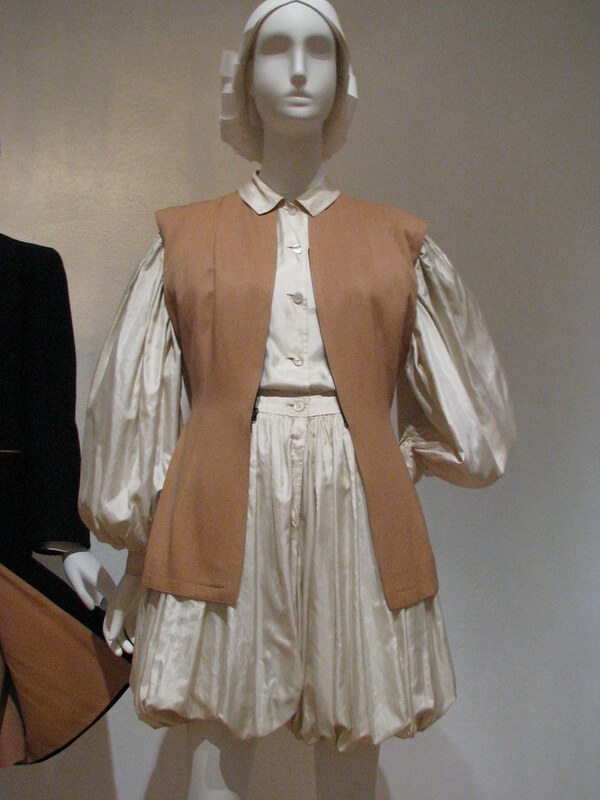 Best in Show: Being olive-skinned, I’m no fan of beige-y shades, but this dress was just spectacular — from the cut to the creamy fabrics to the dainty black ribbon at front. 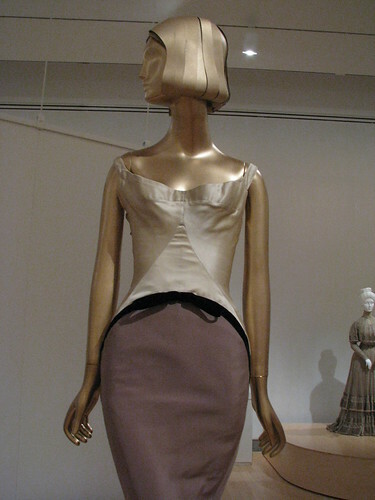 And that Dominique De Menil…she had quite the bod. A little more Charles James: His Four Leaf Clover Dress from 1953. 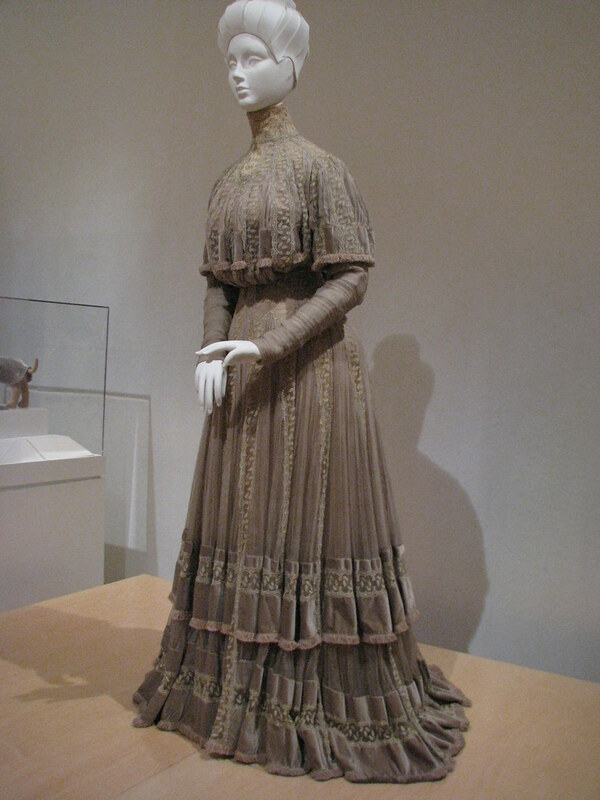 See another version of this dress here. 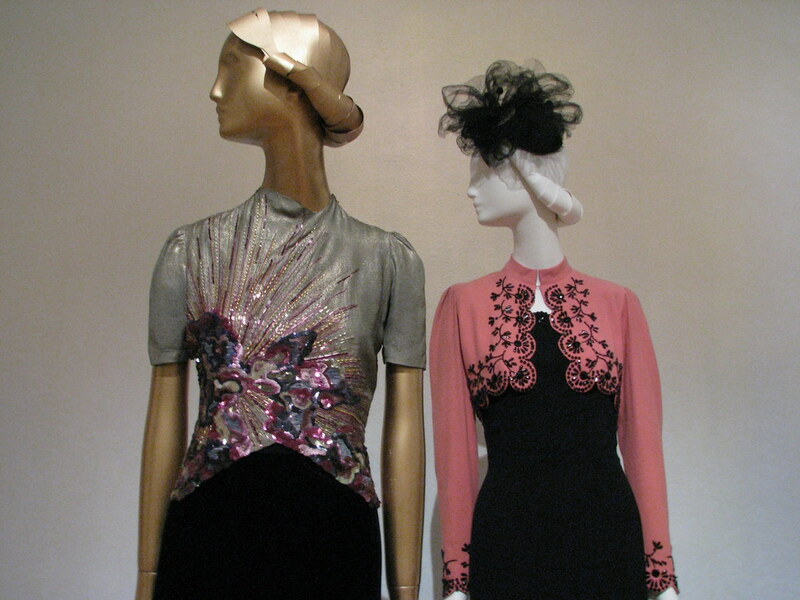 A Jean Dessès evening gown from 1956, crafted with coral and gold Lurex and trimmed with mink. 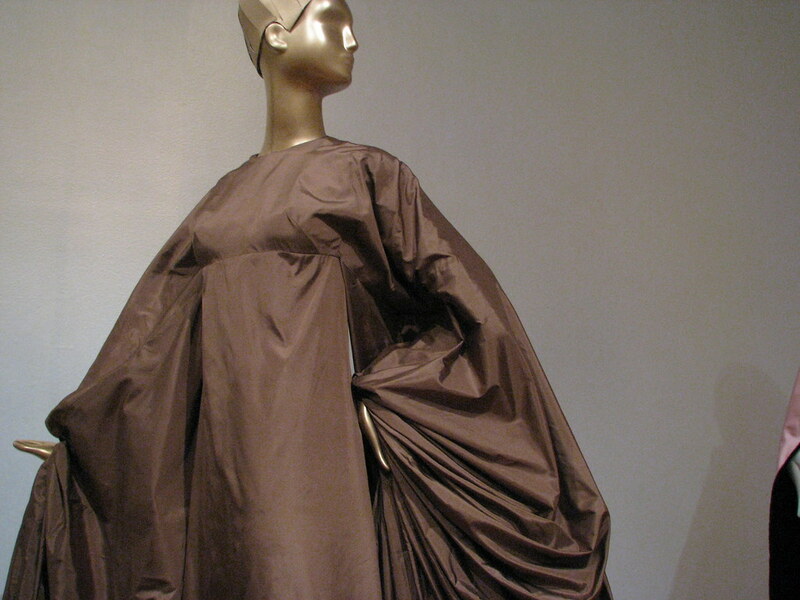 To the right: No capes, but fantastic sleeves, courtesy of Madame Alix Grès. 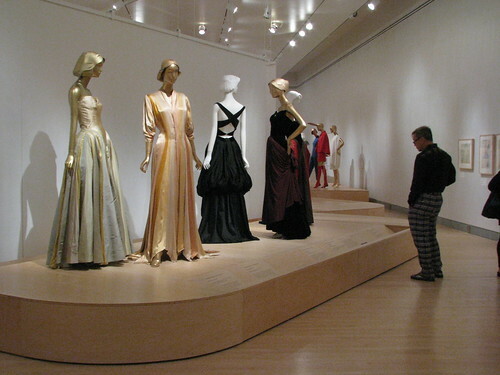 What does one wear to admire couture? Plaid pants, naturellement. A 1959 evening gown by Marguery Bolhagen (who once served as an assistant to Charles James), made for socialite/reporter Austine Hearst, otherwise known as Mrs. Randolph Hearst. 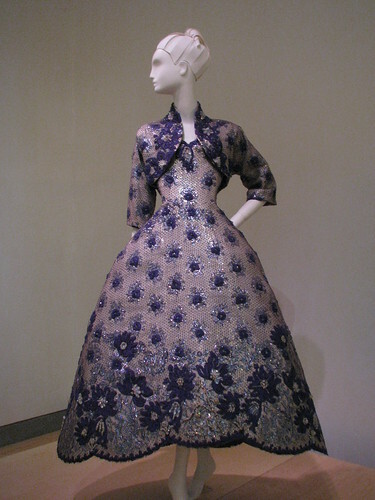 She wore it to John F. Kennedy’s inaugural ball in 1961. Now for a little Elsa Schiaparelli. The ensemble at left is from 1938-39, while the one on the right is from 1940. 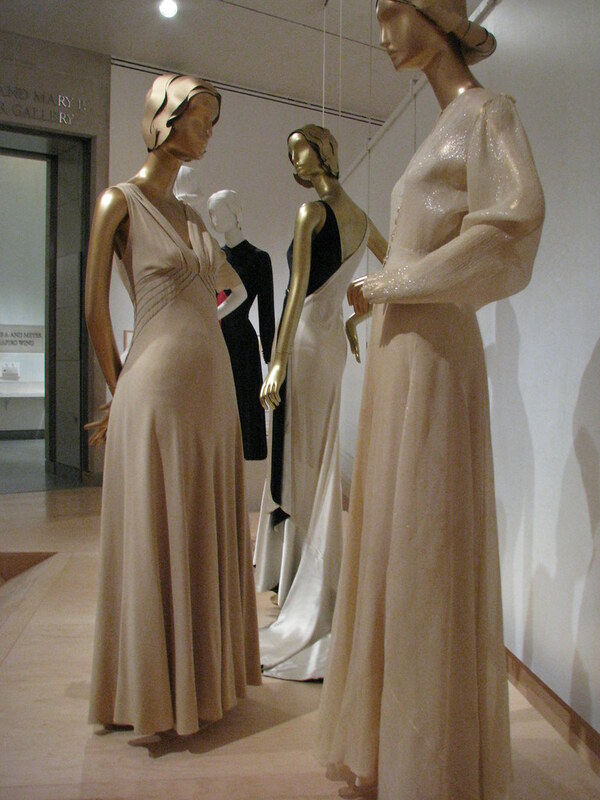 A trio of gowns (left to right), by Valentina (1938), Jessie Franklin Turner (c. 1930), and the shimmering Diamond Horseshoe evening dress by Elizabeth Hawes (1936). Arnold Scaasi (1951) and Norman Norell (1955). Okay, so the designers didn’t always hit it out of the park. Here we have a little couture gone Robin Hood: a 1942 design by Vera Maxwell that is all about the bloomers. 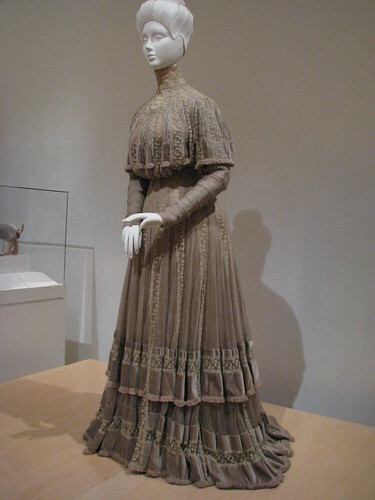 I didn’t bother with too many photos of the dresses from the Victorian era because…well, just look at her. And the award for most flamboyant goes to… Arnold Scaasi! 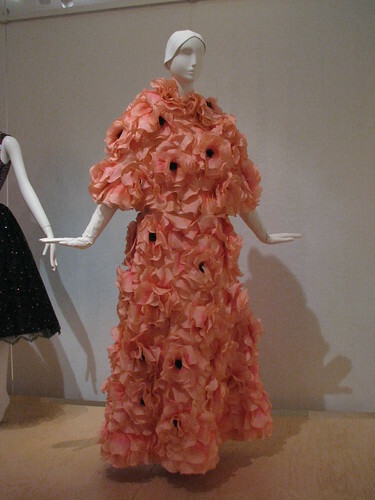 — for his 1983 evening ensemble made out of an entire 99-cent store’s worth of silk and taffeta flowers. The best part of this is the wall text: “This walking garden would have added a festive note to any of the many social events that Austine Hearst, the owner of the ensemble, attended.” For reals. Divine! In every sense of the word. Can’t wait!